The ‘macchia mediterranea’ (literally mediterranean spot) is a term referring to all mediterranean local plants, usually shrubs and bushes. It can include Juniper, Oregano and others. This kind of plants are able to survive even in case of very hot summer and lack of water. 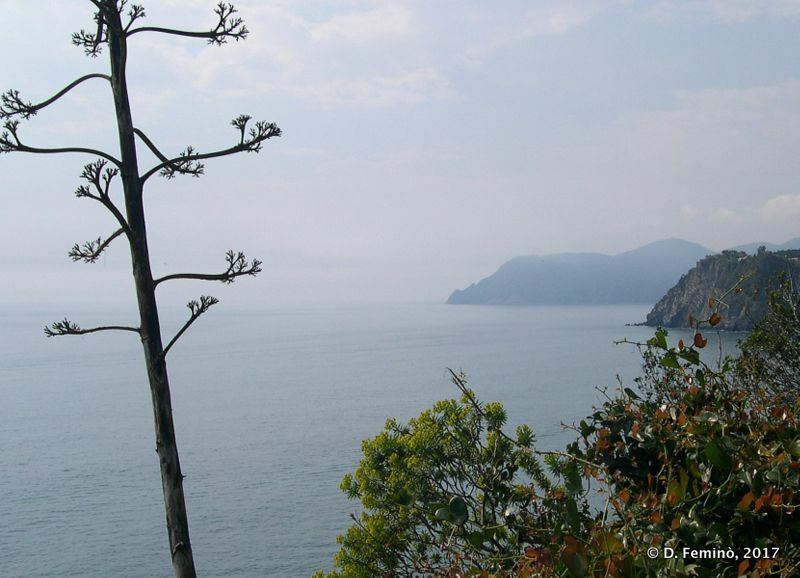 The “macchia mediterranea” is a very distinctive characters of Cinque Terre. In those pages you can find some shot on this topic. 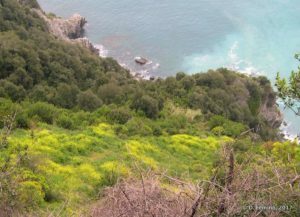 First picture with cliff covered by green is a good example. 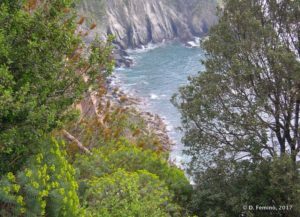 Below you can find another nice specimen of Cinque Terre landscape. 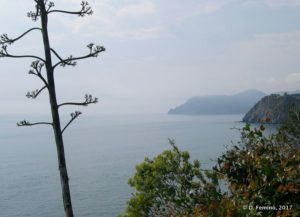 The cactus and the agaves, sea in background makes this picture a sort of postcard. Here you see another picture taken in the Natural Park of Cinque Terre. On the back you can see Mesco point (Punta Mesco), the sea is a bit rough. On foreground there is a flowered agave. 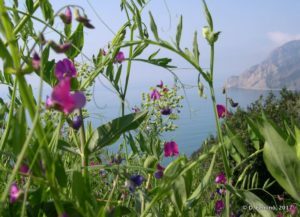 On sunny days, like the one in which I took those picture, anyone is literally dazzled by the colours of this wonderful land. 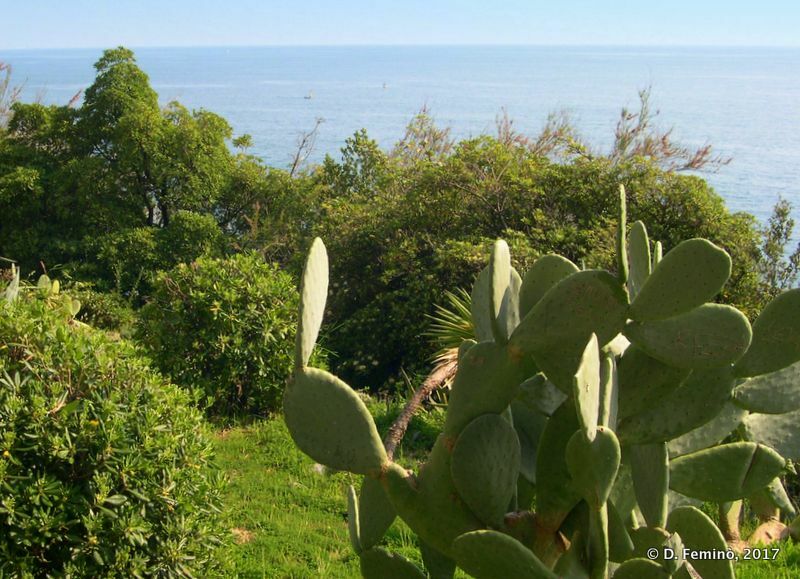 The magnificent mix of greenery with blue of the sea paints landscapes of unbeatable beauty. 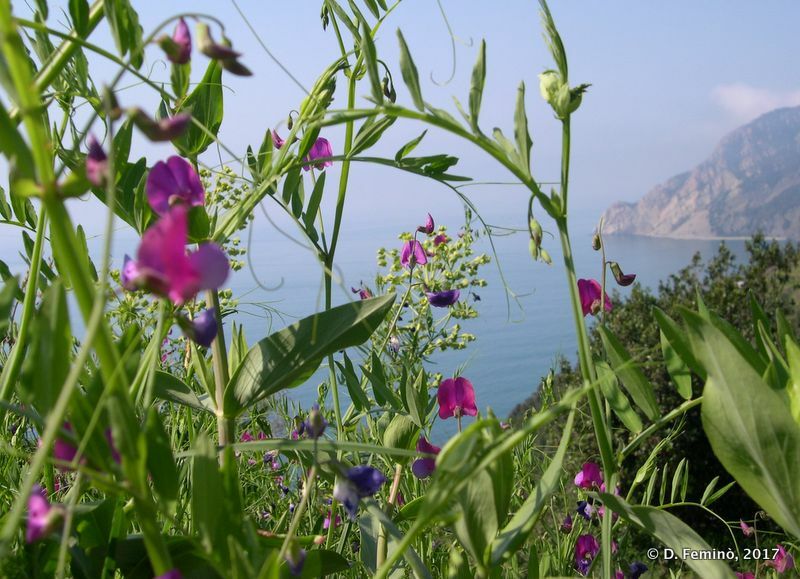 Usage of “terraces” is the only way found by locals to grow plants on this hard land dramatically going down to sea. As result however they got wonderful wines. “Cinque Terre” white wine is one of them, perfectly paired with fish courses. But the real protagonist of local cellars is Sciacchetrà, a sweet wine whose taste can’t be described. You have to try it. 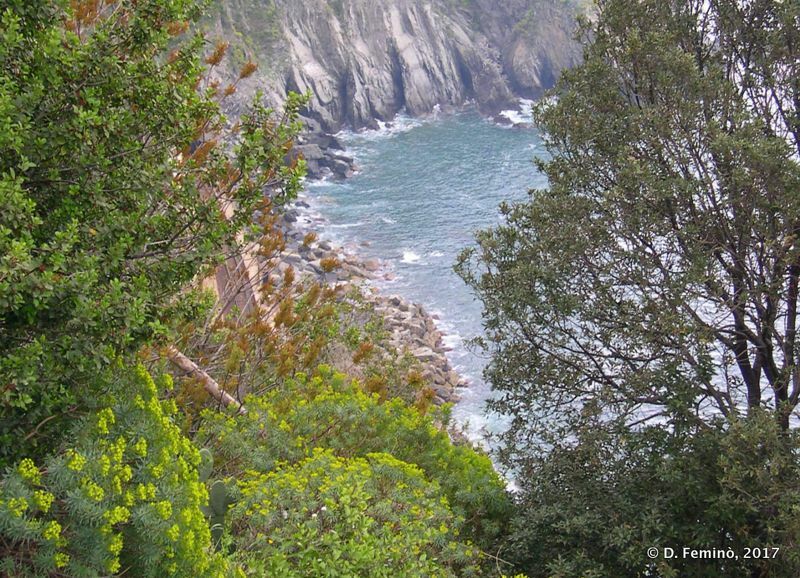 When you walk in the natural park of Cinque Terre, it is very common, just behind a turn to see suddenly an opening between the trees and with an astonishing view depicting in front of you. It is ok to be amazed but don’t forget to take a look on where you put your feet. 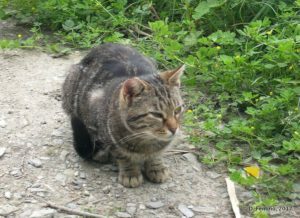 Frankly speaking I do not know which are the typical animals of Cinque Terre. For sure, cat is one of them. Cats, cats, cats everywhere. They became a sort of local brand appearing on all kind of gadgets. 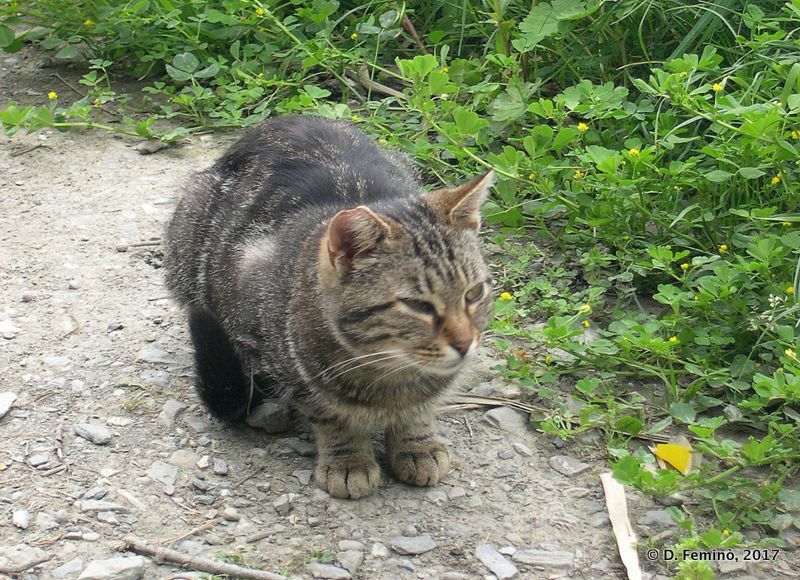 Cat in this picture, quietly sitting in one of the resting area available along the “via dell’amore”, doesn’t seem to care so much about the world around. 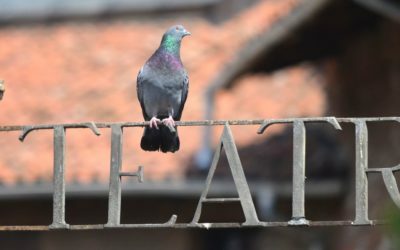 Good season is arrived and he can enjoy sun and food from generous tourists. 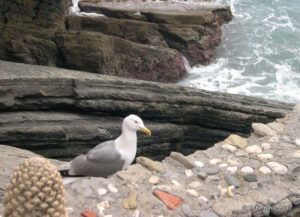 On Vernazza tower I met this seagull, standing on a terrace, maybe resting after fishing. In the back, waves enter between rocks. 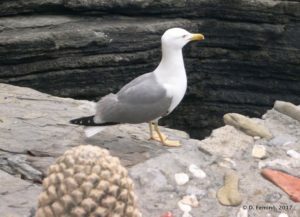 The seagull was so indifferent that I had the chance to get very close as you may see in this close-up. Who knows if seagulls are able to think? And if the answer is positive what do they think about? For sure, this guy lacks just a pipe in the spout to look as an old seawolf carefully looking at wind and clouds to understand how is going to be the weather. This post was originally published in 2004 on www.femino.it, a website that I also manage. 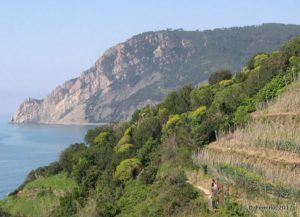 Now I’m going to move on smalltravelguides.com all posts about travels that were originally published on femino.it. This is the first one.